Lygodium (climbing fern) is a genus of about 40 species of ferns, native to tropical regions across the world, with a few temperate species in eastern Asia and eastern North America. It is the sole genus in the family Lygodiaceae, though included in the family Schizaeaceae by some botanists. They are unusual in that the rachis, or midrib, of the frond is thin, flexible, and long, the frond unrolling with indeterminate growth and the rachis twining around supports, so that each frond forms a distinct vine. The fronds may be from 3–12 m (9.8–39.4 ft) long, depending on the species. Some Lygodium species are now considered very problematic invasive weeds in the southeastern United States. Populations of Lygodium have increased more than 12-fold over the past decade, as noted by Florida's Institute of Food and Agricultural Sciences. 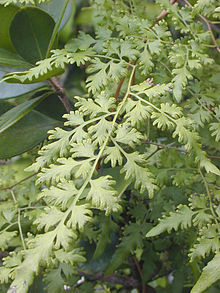 Japanese climbing fern (Lygodium japonicum) was added to the Florida Noxious Weed List in 1999. It is also a major problem in pine plantations, causing contamination and harvesting problems for the pine straw industry. Old World climbing fern (Lygodium microphyllum) infests cypress swamps and other hydric sites, forming a monoculture. This massive infestation displaces all native flora and fauna, completely changing the ecosystem of the area. Plants in this genus have basal chromosome counts of n=28, 29, 30. Lygodium articulatum – New Zealand (North Island). Lygodium circinatum – Tropical Asia and Australasia. Lygodium cubense – Cuba, Hispaniola. Lygodium flexuosum – Southern China south to northern Australasia, Kerala(South India). Lygodium japonicum – Japanese climbing fern. Eastern Asia south to northern Australia. Lygodium microphyllum (Cav.) R. Br. – Old World climbing fern. Africa, south Asia and Australia. Lygodium palmatum (Bernh.) Swartz – American climbing fern. Eastern United States (rare, confined to acid soils). Lygodium reticulatum – Australia, Polynesia. Lygodium salicifolium – Southern China south to northern Australasia. Lygodium trifurcatum – Tropical southeast Asia south to northern Australasia. Lygodium volubile – Northern South America, Central America, Caribbean. Lygodium versteeghii – Tropical southeast Asia south to northern Australasia. Lygodium yunnanense – Southern China. ^ "SS-AGR-21/AG122: Natural Area Weeds: Old World Climbing Fern (Lygodium microphyllum)". Edis.ifas.ufl.edu. Retrieved 2014-07-15. ^ "Japanese climbing fern—Lygodium japonicum | Center for Aquatic and Invasive Plants". Plants.ifas.ufl.edu. Retrieved 2014-07-15. ^ "Flora of New Zealand | General Profile | Lygodium articulatum". Nzflora.info. Retrieved 2014-07-15. Wikimedia Commons has media related to Lygodium. "Lygodium Sw". Australian Plant Name Index (APNI), IBIS database. Centre for Plant Biodiversity Research, Australian Government. Species Profile- Japanese Climbing Fern (Lygodium japonicum), National Invasive Species Information Center, United States National Agricultural Library. Lists general information and resources for Japanese Climbing Fern.